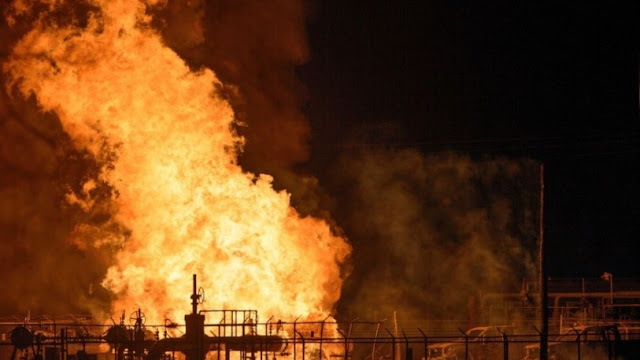 One worker was missing and two were injured after an explosion sparked a fire at a Louisiana pipeline Thursday night, officials said. Authorities don't yet know what caused the fire on the Phillips 66 pipeline in Paradis, but a crew of six workers was cleaning it at the time, St. Charles Parish Sheriff Greg Champagne said at a news conference. Two of the workers were hospitalized — one taken to a burn center— and three had minor or no injuries, the sheriff said. The remaining worker was unaccounted for, and a helicopter was being brought in to help search for him. Champagne said the source of the 20-inch pipeline had been shut off but the fire would have to burn off the rest of the liquid inside, which could take hours or even days. "They tell us the best thing that can happen right now is for the product to burn off," he said. The pipeline was carrying a highly volatile byproduct of natural gas, which was burning cleanly and very hotly over a 30- to 40-foot area, the sheriff said. "It's just a big blow torch," he said. Sixty homes were evacuated and highways were being diverted around the area in Paradis, which is about 30 miles west of New Orleans. Responses to "Workers injured after massive explosion sparks fire at Louisiana pipeline"